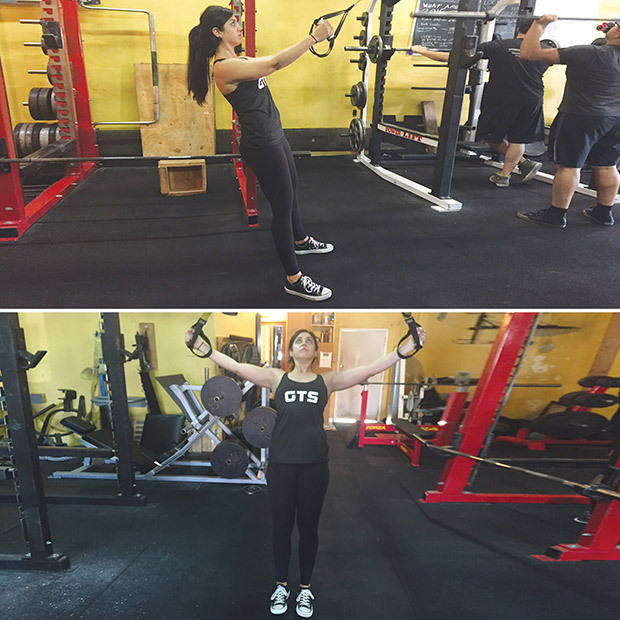 Whether you're brand new to TRX or a total pro, this circuit will give you a killer workout. Think about gymnasts, rock climbers, and dancers. What do these athletes all have in common? Their sports involve supporting their ownÂ bodyweight, and they all have stunning physiques.Â Training withÂ your own bodyweight is actually one of the best waysÂ to improveÂ your overall strength, muscle tone, flexibility, and cardiovascular capacity. That's why I love TRX. This simple toolÂ allows you to perform a variety ofÂ effective exercises using your own weightâand you can use itÂ just about anywhere. Whether you're brand new to TRX or a total pro, here's a circuit will give you a killer total-body workout. Perform 10 reps ofÂ each exercise. Then rest for 1 minute and repeat the circuit. Aim forÂ 2-3Â rounds. Start by holding the TRX straps with your arms straight in front of you. Step back a few feet so thatÂ your arms are raised forward. From here, squat down and sit back into your heels. Stand back up. Then squat down again, but this time jump straight up, using the straps to counter your weight. 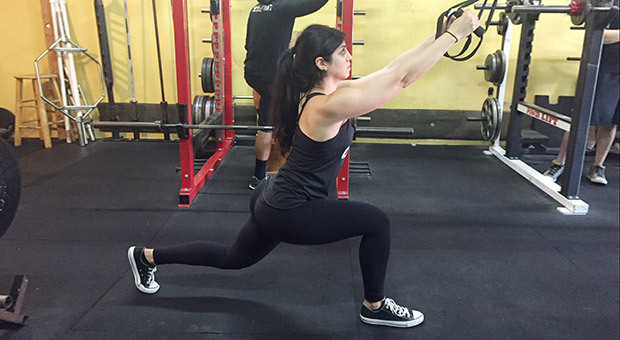 The squat plus jump counts as one rep. (If you have any knee issues, stick to just the squat and skipÂ the jump). Place your feet in the TRX straps with your toes pointingÂ down. From here, get into a plank position with your hands just below your shoulders and your core tight. To begin the movement, slowly pull your feet towards your face. Be sure toÂ keep your legs straight the entire time. Continue moving upward until your body creates an 'A' shape. Hold for 1 second before lowering down back to plank position. 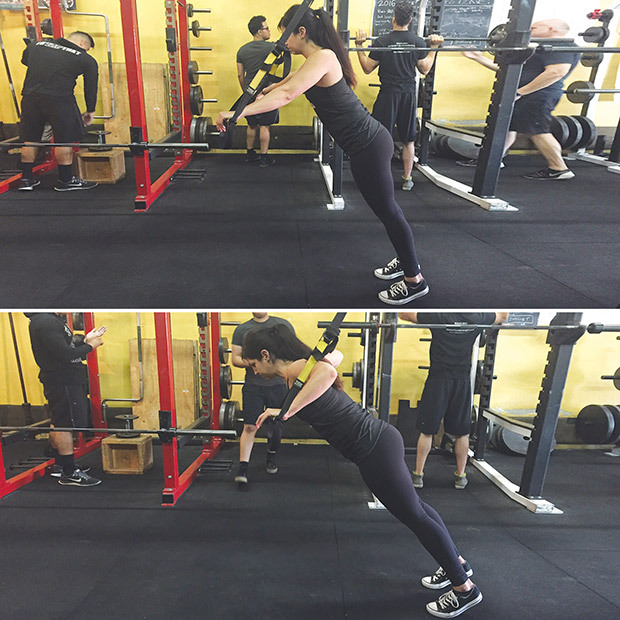 Grab both TRX handles and walk your feet forwardÂ as you lean into the strap. Make sure your body creates a straight line and your core is tight throughout the movement. Start by bringing your hands wider than shoulder width, with your arms straight. Slowly bend your arms and lower down until your chest is parallel with your hands. From here, press back up until your arms are straight again. Keep in mind, the closer to parallel your body gets to the floor, the harder the movement will be. Hold onto the TRX straps with both arms straight and your feet together. From here, step back with your leftÂ foot and lower your left knee towards the floor. Step your left foot back up to meet your right. Repeat on your other side. Grab both TRX handles and lean back as you walk your feet forward. Throughout the movement, be sure to keep your core tight and body in a straight line. At the beginning of this movement, your arms should be straight. From here, pull your body towards your hands while driving your elbows straight back. Hold for 1 second and then slowly lower back down until your arms are straight again. The further you walk your feet forward, the harder the movement will be. Grab both TRX handles and lean back as you walk your feet forward. Once again, keep your core tight and body in a straight line. While keeping your arms straight, pull your hands out wide as your body comes forward. Hold for 1 second and then slowly allow your arms to come back together while lowering the body down. Jennifer CohenÂ is a leading fitness authority, TV personality, best-selling author, and entrepreneur. With her signature, straight-talking approach to wellness, Jennifer was the featured trainer on The CWâs Shedding for the Wedding, mentoring the contestantsâ to lose hundreds of pounds before their big day, and she appears regularly on NBCâs Today Show, Extra, The Doctors and Good Morning America. Connect with Jennifer onÂ Facebook,Â Twitter,Â G+Â and onÂ Pinterest.